The role of the CFO has undergone a profound transformation in recent years. Traditionally, the CFO fundamentally had three main tasks: the books and records of the company, financial reporting, and statutory compliance. Today's CFO is fundamentally different from the CFO of yesterday. Today's CFOs drive the direction and success of the organizations they work in using their knowledge and understanding of the financial position of the company. The "older" set of tasks continue to be mission critical, but are now seen as minimum requirements: CEOs take them for granted. Leadership – To be an effective business partner, today's CFO must have the necessary leadership and communication skills. They must give advice and counsel as well as provide a voice of reason. Operations – They should possess a strong understanding of the company's business model and industry and be able to use this knowledge to provide an independent perspective and to constructively challenge the commercial and operations teams, ensuring that business decisions are grounded in solid financial criteria. Controls – In an increasingly global and volatile environment with additional regulatory burdens, it often falls to the CFO to ensure adequate assessment and mitigation of risk as well as compliance with applicable regulatory or other legal requirements. Strategy – Supporting strategy development and helping enable its execution. The CFO also plays a role in prioritizing and ensuring the strategy can be funded. Behavioral competencies are key to the business partnership role—a "seat at the table" must be earned. A CFO needs to be a visible leader in the business, an excellent communicator, and an influencer. Finance needs to be embedded throughout the business, providing decision support to key functions such as commercial, operations, and manufacturing. The most effective finance teams I have worked in had dedicated finance analysis and support attached to the most important functions in the business. Access to timely, accurate data is a key enabler to finance productivity and decision support. Automated reporting and analytics allow more time to be dedicated to forecasting and predictive analysis. Technology will play an increasingly important role for the CFO, but its effectiveness depends on the accuracy, availability, and consistency of data, and on robust, integrated technology infrastructure. CEOs want "'more for less" from their finance function. The finance function is now increasingly being assessed in terms of its effectiveness (its ability to deliver what the business needs) rather than a narrower focus on its efficiency (its cost in serving the business). Are today's CFOs ready for the challenge? According to a 2014 Accenture study, "CFOs have taken the right steps and finance is advancing. We see evidence of a stronger and more capable finance function and CFO, which contributes to their growing influence." However, in their 2018 Survey, The New CFO Mandate, McKinsey found that "CFOs and their peers have diverging views about where CFOs create the most value; non-CFOs most often note the value generated in traditional areas." In KPMGs survey, The View from the Top, 45% of CEOs voiced concerns with their CFOs lacking commercial (i.e., non-financial) experience and knowledge while 41% believed they lacked necessary leadership skills. Gain a breadth of finance experience, especially in roles which offer exposure to the commercial and operations functions in the business. Depending on the nature of the business and industry, it may be advantageous to take roles outside of the finance function. Develop a global perspective through international exposure, especially in emerging markets. This experience can help manage through the volatility and complexity often associated with these regions. Look for leadership opportunities and team-building skills through transformation initiatives and major change programs. This will help develop the communication and influencing skills that are necessary for dealing with both internal and external stakeholders. Investment in digital technology will be vital in managing complexity and driving productivity. The CFO must raise his/her game in managing, analyzing, and presenting data in a way that yields the greatest value for the business. Finally, and perhaps the most important element for me, the increased expectations on the CFO mean increased demands on the whole finance function. The very best CFOs that I observed surrounded themselves with the best talent they could recruit and made a big effort to retain them. They made coaching, mentoring, and leadership development a big priority through all levels of the finance organization. Thirty years ago, when I was a freshly minted graduate entering the corporate world, the role of the CFO was, in essence, fairly straightforward. The CFO fundamentally had three main tasks: the books and records of the company, financial reporting, and statutory compliance. CFOs tended to be number-crunchers who operated behind the scenes and were usually the ones who said “no” to things due to budgetary reasons. Strategy and decision-making were left to the rest of the C-Suite, while the CFO was confined to more of a “sign-off” role than anything else. But in the thirty years that I have been operating in this function—in which I have worked in large multinational corporations ranging from $250-$900 million in turnover, and where I have led simplification projects across geographically disparate finance teams in countries like the UK, Germany, Belgium, and Hungary—I have seen a significant shift in the expectations placed on the CFO and finance team. Today’s CFO is fundamentally different from the CFO of yesterday in very important ways. While the CFO of yesterday was more of a support function, the CFO of today and of tomorrow is of strategic relevance to a company. Today’s CFOs drive the direction and success of the organizations they work in, and rightly so, given the ever-changing business environment we operate in. The purpose of this article is therefore to outline the roles and responsibilities of the modern CFO. I will first run through an overview of the role, and will then share some of my own personal insights that I have developed over my thirty-year career. There’s no doubt that the historical tasks of the finance function such as books and records, financial reporting and statutory compliance are still of fundamental importance. These tasks continue to be mission critical and fall squarely under the responsibility of the finance team, and consequently, the CFO that leads the team. But while they continue to be relevant, these tasks are now taken for granted by CEOs. This does not mean they are any less important, it’s just that they are now seen as minimum requirements for finance. What has significantly changed, however, is that the CFO of today and of the future must be able to take financial data and use it to influence operational decision-making and strategy. CFOs must possess many more skills than just the technical accounting background of the past. Today’s CFOs are also effectively Chief Operating Officers in addition to their finance role. They are business partners to the CEO, who help guide and influence decision making using the financial context as an integral driver of such choices. Leadership – To be an effective business partner, today’s CFO must have the necessary leadership and communication skills. They must give advice and counsel as well as provide a voice of reason. They are often asked to lead group-wide transformation programs and must be able to translate detailed information into clear, concise, and accessible messaging. It goes without saying that creating a top talent pipeline to ensure the right people and leadership skills are in place within the finance function is also critical. Operations – they should possess a strong understanding of the company’s business model and industry and be able to use this knowledge to provide an independent perspective and to constructively challenge the commercial and operations teams, ensuring that business decisions are grounded in solid financial criteria. They must navigate complex data and provide analytics and predictive scenarios that drive action and decision-making. The CFO should also identify opportunities for top-line growth and drive profit improvement, not just through the traditional methods of cost control, but through examples such as product line/regional profitability analysis and benchmarking against industry peers. Controls – in an increasingly global and volatile environment with additional regulatory burdens, it often falls to the CFO to ensure adequate assessment and mitigation of risk, and compliance with applicable regulatory or other legal requirements. They must understand risk through a commercial as well as a financial lens. Therefore, they need to manage risk as the business executes on its strategies and initiatives as well as maintain a strong internal controls environment and financial reporting processes. Strategy – supporting strategy development and helping enable its execution. The CFO also plays a role in prioritizing and ensuring the strategy can be funded. The finance skillset is very applicable to building predictive modeling, analyzing macroeconomic trends, and incorporating non-financial information. This also includes communicating the strategy and progress against it to external stakeholders and investors. With the above in mind, I’d like to add my personal perspective and advice on what differentiates the best CFOs from the rest. Behavioral competencies are key to the business partnership role—a “seat at the table” must be earned. A CFO needs to be a visible leader in the business, an excellent communicator, and an influencer. Curiosity is an attribute often highlighted as a required skill—a previous CFO boss of mine would turn up to meetings he had not been invited to, just in order to find out more about what was happening in the business and challenge where he felt decisions were being taken without the necessary finance input. Finance needs to be embedded throughout the business, providing decision support to key functions such as commercial, operations, manufacturing. The most effective finance teams I have worked in had dedicated finance analysis and support attached to the most important functions in the business. This opens up the dialogue between finance and operations and it fosters a better flow of data between areas of the business. This makes the functions more accountable for their financial metrics and also allows the finance team to provide more insightful commentary through a better understanding of the business. Another previous CFO boss of mine gave me one of the best pieces of feedback I have received—“Don’t be a postbox,” meaning that it’s not enough for finance just to produce static snapshots of the company’s financial health. The CFO must paint the picture for the business and translate the financial data into meaningful commentary, trends, and actions. Access to timely, accurate data is a key enabler to finance productivity and decision support. Automated reporting and analytics allow more time to be dedicated to forecasting and predictive analysis. Technology will play an increasingly important role for the CFO, but its effectiveness depends on the accuracy, availability, and consistency of data, and on robust, integrated technology infrastructure. Many companies are still struggling to put these foundations in place. To succeed, CFOs will have to be champions and stewards of digital technology. CFOs must adapt to new technology and be at the forefront of ERP implementations and cloud-based solutions. A common mistake I have observed in large scale ERP implementations is that the project does not get resourced with the right skills. Often, an ERP project is seen as an opportunity to “park” underperforming finance talent when the opposite should be occurring—the very best and brightest finance talent should be placed into ERP project implementation teams to ensure success. CEOs want “more for less” from their finance function. The finance function is now increasingly being assessed in terms of its effectiveness (its ability to deliver what the business needs) rather than a narrower focus on its efficiency (its cost in serving the business). As we have seen, the CFO role is developing and expanding. The CFO of the future will add most value as a business and strategic partner to the CEO, being commercially savvy and managing external relationships. But are CFOs ready? Do they have the necessary skillset to meet the new requirements of the role? What do CEOs and other key stakeholders/peers think? Are more likely to report high levels of satisfaction with their finance function across most dimensions. Tend to have CFOs who have seen their strategic influence grow in recent years. For example, finance leaders of high-performance businesses report a greater increase in influence over providing insightful analytics to the business, executing business transformation initiatives for the broader enterprise, and influencing the strategic planning process. Are more likely to have carried out operating model rationalization and moved to a “global business services model” (which Accenture defines as having greater agility and control through end-to-end process ownership and delivery of mid-office as well as back-office services). Have finance leaders that are more engaged in assessing technology investments. KPMG, in their survey “The view from the top,” also noted the top concerns that CEOs had with regard to the CFO skillset. 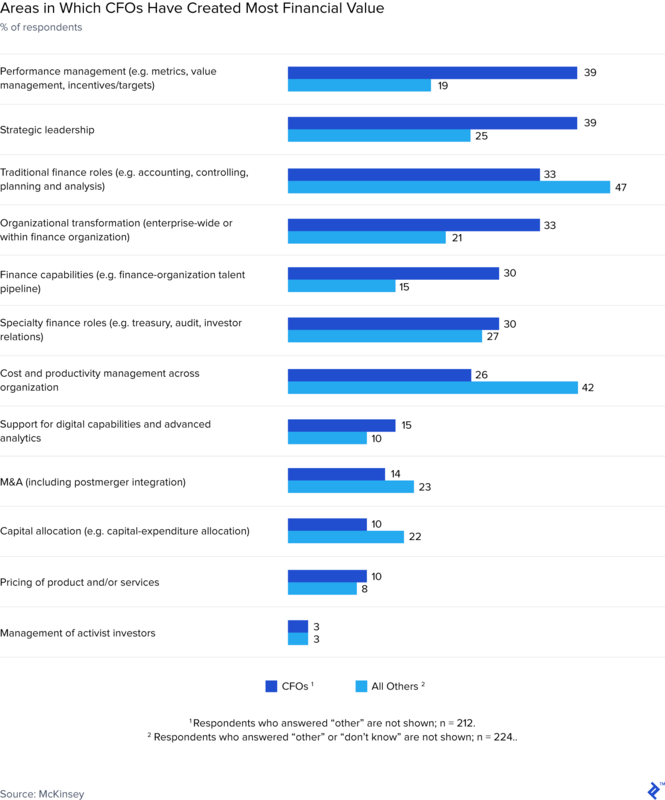 Finally, and perhaps the most important element for me, the increased expectations on the CFO mean increased demands on the whole finance function. The very best CFOs that I observed surrounded themselves with the best talent they could recruit and made a big effort to retain them. They made coaching, mentoring, and leadership development a big priority through all levels of the finance organization. They not only spent time on individual succession planning for key roles in the organization, but also on ensuring the right balance of technical, analytical, and leadership skills within their team. They judged their own capability on the strength of the team they had around them. What is a CFO in charge of? A CFO is in charge of a company’s financial operations. This includes responsibility for internal and external financial reporting, stewardship of a company’s assets, and ownership of cash management. Increasingly, the role is more forward-looking and expanding to incorporate strategy and business partnership. Is the CEO higher than the CFO? In a typical company structure, the CFO reports into the CEO, although it is common for both roles to be part of the board of directors. Most CFOs have experience covering disciplines such as financial planning and analysis, controllership, and treasury. This may can be obtained via training programs with a company before taking on increasingly senior roles within the business and/or time spent with an accountancy firm before moving into industry. What qualifications do you need to be a CFO? Typically, a CFO would have a university or college degree followed by a technical accounting qualification such as a CPA, ACCA, CIMA. Increasingly, leadership and communication skills are assuming more importance. What should I look for when hiring a CFO? As well as the requisite technical skills and qualifications, a CFO should have leadership, communication, and influencing skills. A breadth of experience across different finance disciplines and either industries or geographies should enable a CFO to be a business partner and add strategic value. What is most important to a CFO? A CFO looks to contribute outside of the confines of the traditional CFO role, using financial analysis to support and challenge decision-making as well as involvement in strategy. A business environment that enables this is important as well as one that offers the opportunity to undertake different challenges.